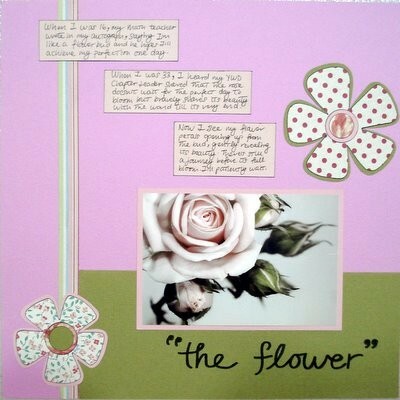 This scrapbooking idea is one that probably makes you go, “Oh, I’ve never thought about that!” So here goes, you have to think of one thing or item that represents you. Want to know how this idea came about? I was about to wake up this morning, and the idea just hit me! When I was fully awake, I wondered if I should go along with this idea and I thought why not? So pick your brains a little. Do you see yourself as a microphone? Do you imagine yourself as the soaring eagle in the sky? Or have you always felt that the classic little black dress scream YOU to the world? For me, instantly the answer is the flower. I guess that’s because when I was in school, a Math teacher wrote in my book that he saw me as a flower bud and hoped that I would achieve my perfection someday. Somehow, his words stayed with me through the years and I would sometimes think about its meaning. Then sometimes last year, a friend shared the story of the snail and the rose. She told us how the rose didn’t see the logic of holding out for the perfect day to share its beauty with the world. Instead, whether it’s rain or sunshine, the rose stood up courageously to share its fragrance and beauty with the world. Ok, it’s your turn now. If you gotta find one thing to represent you, what would that be? The more I think about it, the more fun this idea gets! Enjoy! Photo credit: Beautiful sepia rose with buds by Subbotina Anna, from Shutterstock.com. Supplies used: Cardstocks – Bazzill Basics; Patterned papers – Making Memories “Vintage Hip Collection”; Black ink – Versa Color; Black pen – Zig Memory System “Millennium”; Black marker – Zig Memory System “Writer”; Sketch: No. 127 of 500 Scrapbooking Sketches.